Email is most salespeople's primary system of client communication and record keeping. With that in mind, every interaction paints a picture of you, your brand, and your professionalism. Needless to say, your email signature can go a long way in leaving a lasting impression. If you’ve been a Pipedrive user for more than a few weeks, you’ll have noted the importance we attach to our email integration. It is something that we work very hard on improving so our customers don't have to constantly switch between their email and Pipedrive. A key complaint from many customers has been the limitations of our email signatures. If you’re one of these people, we have great news for you. Until now the Pipedrive’s email signature editor has allowed only plain text, which we recognized was quite limiting. There was obviously a need to insert images, hyperlinks, and other design elements so that you could put your best foot forward and precisely represent your brand. That’s why we’ve built the WYSIWYG (What You See Is What You Get) editor for email signatures. By having this capability, you can formally identify yourself better especially to new prospects when doing activities such as sending a cold email. When you click the compose button on your Pipedrive Mail page, a pop-up of a blank email will appear. You will note the signature button in the composer toolbar at the bottom-right of this page. Click on this and a basic text editor will appear. 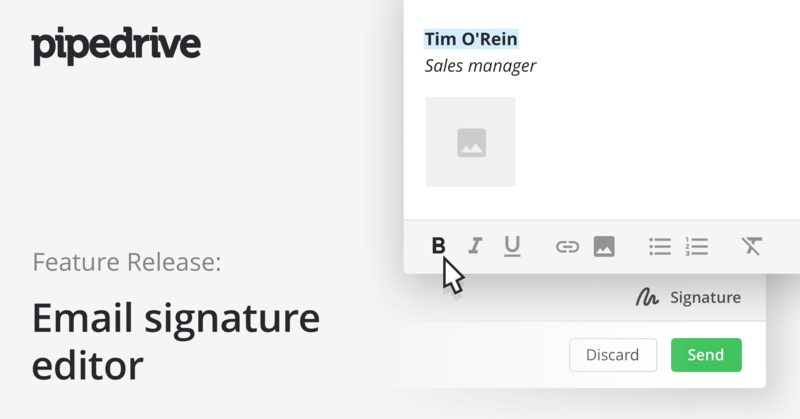 Now you can compose your signature and include images, hyperlinks, rich text, disclaimers and more. With this editor, you can now make sure you always make a good impression. We have rolled this out to all users, so why not head over to your email page and start building your signature now?